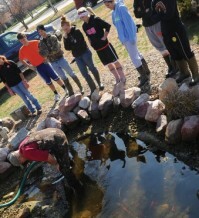 Yep, that’s me, Bob Feurer the 2011 Nebraska Teacher of the Year in the waders in the middle of the pond! I sponsor the North Bend Central Science Club. The club has 69 members this year out of a total eligible population of 160, so we have over 1/3 of our student body as members. The pond cleanup has been an annual event for the past 11 years. We’ve done it in snow and have had to break ice some years as we need to wait for leaf drop. The pond was a project the club wrote a grant for and was installed and maintained by them for that entire time. Bob describes himself as an “artisan” teacher. “I’m not a ‘book teacher’. I mostly use the texts as reference for self-created lessons. I’ve created a curriculum design in my classes that kids like and learn from.” He’s also making his district’s tighter budget go further. Bob Feurer has been teaching at North Bend Central High School for the entirety of his 33-year career—“Same room, same desk, same tables!” The 2011 Nebraska Teacher of the Year spends his days teaching biology and global science to 7th-12th graders, as well as assistant coaching track. For many years, he also coached football and wrestling. He’s a classroom superhero who aims to create “seeing eyes” in his students by going above and beyond his daily lessons. Excellence in Math/Science Teaching in 1994 and the 1996 Tandy Technology Scholar Award winner.